Children are natural gardeners. They possess incredible curiosity and get excited to try and do new things–qualities that we adults can learn from! On top of that, children often learn better by doing and not just reading. As an additional bonus, they love to play in the dirt (and be honest parents–we love it, too)! 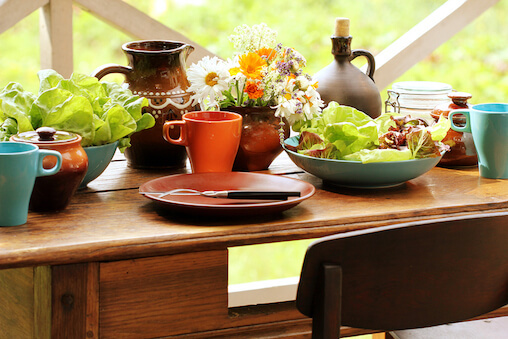 Learning to garden as a child helps build qualities often missed by school curriculum. The kids learn environmental appreciation and understand the process of seed to growth to life. That understanding helps them appreciate things like how the food supply works and why we need to take care of the planet we live on. When kids garden, they also get a sense of pride from seeing the results of their work. The lessons learned from gardening are many and wonderful for children, but it pays to be pragmatic as well. Kids get bored quickly, so you want to choose plants that sprout and grow quickly so the children can see the results of their efforts without losing interest. Because of that, I recommend that you plant flowers with your children. Wildflowers are a great choice because they are fast growing. Plus, with flowers you can take the results of your childrens’ little efforts and bring them indoors to show off to visitors! Since fall is here, you’ll want to plant some great fall color flowers that grow quickly. Calendula is a wonderful choice because they germinate in as little as 5 days and winter well. Plus the flowers are edible! That makes them even more exciting for children because they can eat them in a salad or other favorite dish. 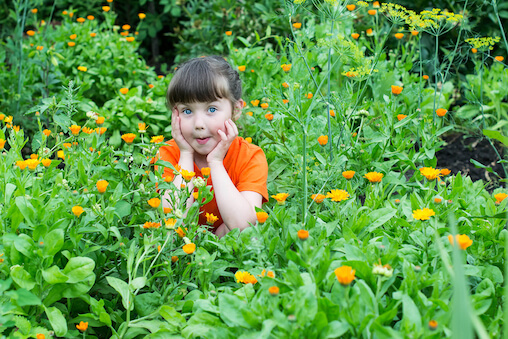 Growing calendula is easy and fun for children. Here are the steps to follow. Be sure to involve your kids as much possible in every step. 1. Select a sunny spot. Calendulas don’t require any kind of special soil, which makes them another great choice for growing with your kids. 2. Plant the seeds 1/4 inch to 1/2 inch below the ground. Very small children may need some help to get this step right. 3. Plant the seeds 4 to 6 inches apart. Make it fun! Have your kids use a ruler to help space the seeds apart (even though a good guess works just fine). 4. Immediately water the seeds after you plant them. It’s fun for kids to play with the water hose, just be careful not to let the children flood them and wash the seeds away! After the initial watering, mist the bed every day until the seeds start to germinate. 5. Once the seeds have sprouted, water them as needed, but just enough to keep the soil moist. You don’t want to over-water. 6. Apply a little compost to the plants once they’re about 3 inches tall. Make the smelly compost part of the fun with exaggerated yucky sounds! 7. As the blossoms begin to fade, have the children clip the fading flowers. This encourages the plant to produce more blooms. Since the seeds germinate so fast your children will see quick results that keep them encouraged to do the work. But if they should get bored, having them design and create a little scarecrow to put in the ground near the flower beds is a fun project that will keep them inspired. 1. Give each child their own garden bed. Let them take ownership of the space. The smaller the child, the smaller the space should be. 2. Have older children? If you have a sandbox from when they were smaller, reuse it for the flowers! Your children already see that space as their own, so the ownership gets transferred. Just make sure it has proper sunlight. 3. Use real tools. Those plastic childrens’ gardening tools are cute, to be sure, but are poor instruments for working in real soil. Just be sure to help small children when using real garden tools, since some may have sharp-ish edges. 4. Definitely start from seeds. It can be tempting to get starters that have already sprouted, but your children will learn a lot more by watching the flowers grow from seeds. If need be, show them pictures online that illustrate what the seeds look like from day to day until they sprout. This will help keep them excited as they see that their seeds are growing and reaching their way up to the sunlight. 5. Be a show off! Any time you have visitors over, be sure to show off your childrens’ handiwork to help them build a sense of pride in their accomplishment. 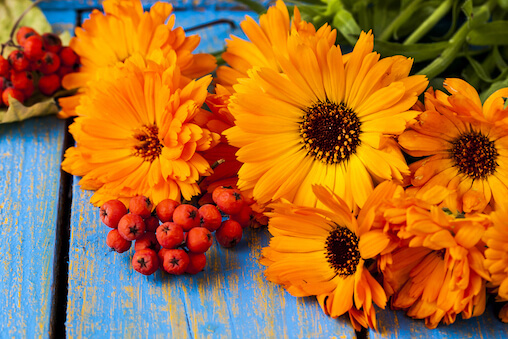 Calendula flowers make a great first-time project for you and your children to do together. Once your kids see the results they are likely to be inspired to plant other flowers or even vegetables that take longer to grow. Gardening is an fun, educational and rewarding experience for children and adults alike. If you’re not a gardener, this would be a great starter project for you as well!